One of the major talking points when it comes to wrestling in this day and age is the emergence and growth of European wrestling, particularly coming from the United Kingdom. What isn't talked about enough, however, is the strength and consistency of a German promotion called Westside Xtreme Wrestling (wXw). To emphasize how much German wrestling flies under the radar, the last time I talked about a German match on this column was almost exactly one year ago. It was a match between Will Ospreay vs, Shane Strickland, and you can find that article here. Like the match covered in that article, this week's featured match is from the annual 16 Carat Gold tournament. The difference however, is instead of focusing on the imported wrestlers, I focus on wrestlers on their main roster instead. And instead of choosing a random first round match, I chose the finals. The tournament was spread out over three nights and featured outside talents such as Matt Riddle, Cody Rhodes, Timothy Thatcher, ACH, and a few others that most independent wrestling fans would be familiar with. 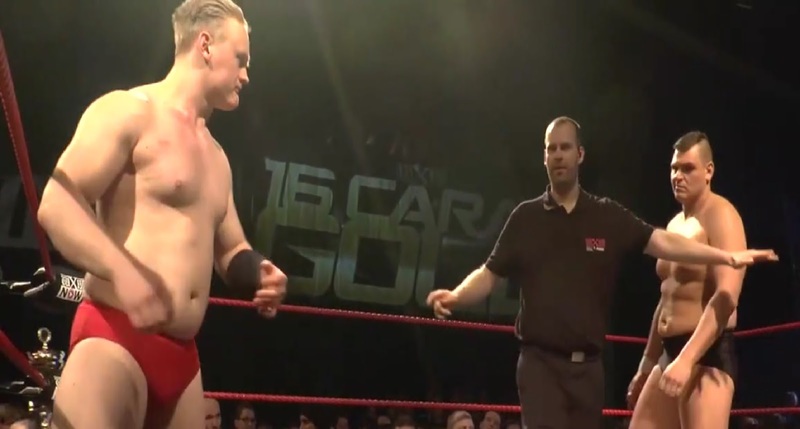 However, the two wrestlers who would reach the finals were wXw regulars: Ilja Dragunov and WALTER. Ilja Dragunov is a young wrestler still pretty early into his career. He's a 23-year-old Russian who uses his heritage as his gimmick. The main difference though is that unlike in the WWE, Dragunov doesn't really play a big bad heel. He's portrayed in this promotion, and especially in this tournament, as a wrestler who's trying to prove to the world what he can do and how good he is. WALTER has been around a fair bit longer, making his debut in 2005. He's a no-nonsense wrestler, who simply wants to hurt his opponents and win his matches. He's been one of wXw's main eventers for a while, having won the wXw Unified World Wrestling Championship three times and their tag team championships twice. He definitely knows what he's doing, and the company clearly has faith in him, which is made evident by the fact that he's made it to the finals of this tournament three times, and won it once. One of my favorite matches of his was up against one of my personal favorite wrestlers: Daisuke Sekimoto, and this is featured below. So what you mainly need to know about Dragunov and WALTER is that both of them can take and dish out a lot of punishment. With that being said, here is the finals of the 16 Carat Gold tournament. If you enjoy "big boi" matches, this is definitely the match for you. Dragunov comes in as the underdog, this being his first finals appearance in this tournament. WALTER goes right at him, punishing him with chops, suplexes and even a power bomb to the apron. Dragunov never gives up, even as his chest starts to bleed and peel from the number of stiff chops he's had to take, proving that chop battles against WALTER are never a good idea. Despite that, Dragunov survives all WALTER has to give, even the Gojira Clutch WALTER used to beat all his opponents with to get to the finals. Ilja Dragunov hits him with Torpedo Moscow (basically a missile headbutt from across the ring), and gets his first tournament win. He shows so much emotion as he wins his trophy, and being able to convey emotions is what makes wrestling all the better. This is a win truly well-deserved, and this match is truly worth a watch. Would you watch more of wXw? What did you think of the match? Leave a comment!